Schools celebrate students in dozens of different ways. They celebrate students’ creativity, academics and attendance. Every student is looking forward to the day as they will have their names called and they will walk with their head held high towards the stage to receive their award. Not for me. In my school days, Awards Day is only for the excellent and the talented. For an average student like me, the next opportunity to walk up to the stage during the ceremony is to be part of the organising committee and I signed up for it. As I was writing this essay, I found many debates online about celebrating students in Awards Day. Regardless if the award was recognising grades or talents, students compete to receive an invitation card to bring home to their parents. Awards Day became a pride and vanity day, so to speak. Now an adult, I have a different view. Awards Day does not just recognise grades and talents, but it should compliment values and attitude. Yet, how do we measure values and attitude? How do we scale them? In a world where competition awards few people on the backs of many, and where rewards and resources are conferred inequitably, it is understandable that children associate awards with a system that reinforces self-worth by naming winners and losers. I was brought up on a numeric scale of grades achieved in school, and now working with a vague idea in mind to stop that culture from taking its roots in Iskul. Iskul Sama DiLaut Omadal (Iskul) proudly marked their first anniversary since the project which started in August 2015. Iskul’s milestone belongs to everyone, namely our students, our Mastal Arikik, our Headmistress, and our donors. Therefore, it is only apt that we celebrate the time and effort they have invested in Iskul. We recognise our student’s attendance to class and we recognise their effort in learning, although unfortunately through grades for now. We recognise our Mastal Arikik’s time and effort to teach. We recognise our Headmistress who multitasks between home, community, environment and Iskul. In short, Iskul wants to recognise and award everyone for being part of the making of Iskul for the past one year. Awards Day is usually associated with collecting certificates and this is where we learn our first lesson. For stateless children who are just learning to read and write in Iskul, their first reaction when they received the certificate was to confirm with us if the certificate will prevent them from getting caught by the enforcement officers when they are in town. It breaks our hearts. The fear and the insecurity in their daily lives were all displayed. 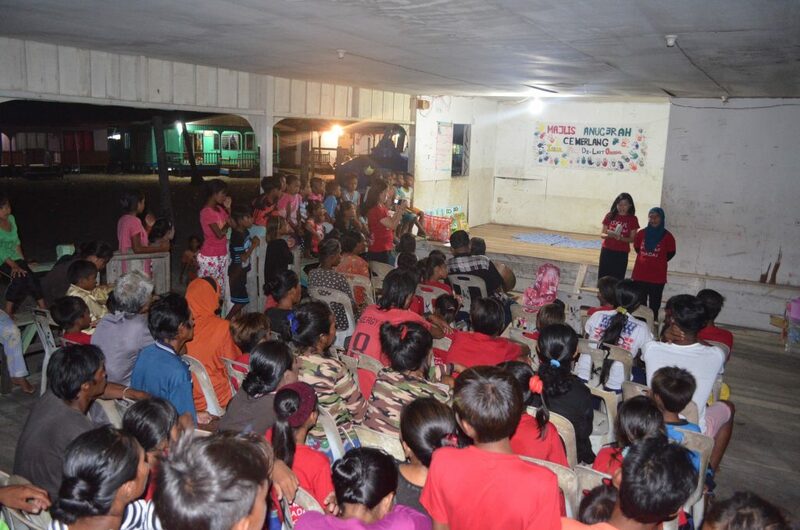 For us urban dwellers, certificates proved our credibility, for these stateless children, the only certificate they even encounter before is a legal document that prevents them from being deported to the Philippines, an unfamiliar place to them for they are considered as illegal immigrants in Malaysia. We learn very quickly that Iskul’s vision to provide them basic literacy has just expanded. During the Awards Day, we had invited our student’s parents to witness the historical moment when their child walks up to the stage to receive a certificate of enrolment from the Head of Omadal Hujung village. I felt teary to see our students walked up the stage when their names together with their parent’s were called – imagine the emotions their parents experience hearing their names called. We took the extra mile to also acknowledge the parents of three top students who did well in examinations as we called them up to the stage to receive food ration as an award. We had been told that the parents of these three children took the extra miles to ensure their children who are enrolled in Iskul to not miss a lesson. Some even forbid their child from following them fishing in the sea if the day after is a weekend because they want their children to go to Iskul and learn to read and write. Therefore, Iskul feels that their parents play a huge role in their child’s achievements as well. In Iskul, we do not want to just recognise those that excel in specific areas; we want to recognise EACH student for the areas in which he/she excels. For that reason, Iskul looks forward to developing the appropriate syllabus that will cater to the development of moral values in our Mastal Arikik and our students as well as their livelihood skills to allow them to help improve their family’s income. Following the Awards Day, we received more requests from other parents who would like to enrol their children to Iskul. Regardless of their motivation, we are pleased to know that we have made aware of opportunities for the stateless community to be literate and Iskul is given a chance to provide that. Hence, Iskul has great ambition to build a house on stilts that can function as classroom spaces for our students and ensure a conducive environment for learning. Currently, they are conducting their classes in the kitchen space of our Headmistress, sidewalk next to one of our Mastal Arikik’s home and in a worn-out community hall (that also poses some danger when lesson takes place). In our long-term vision, Iskul wants to build a culture where everyone feels special in their very unique way. We want our students to feel proud being a Bajau Laut community yet should not sit still obliging to the societal perception where the absence of citizenship will hinder them from breaking away from it. Having the thought in mind, Iskul looks forward to receiving volunteer tutors who would like to spend time in Iskul to instil the important value of self-acceptance in this community, especially the children. In a nutshell, first year anniversary and Awards Day marks another chapter in developing and fine-tuning our operation in Iskul from empowering our Mastal Arikik in teaching to bringing the world closer to our students as well as encouraging good neighbourliness between Malaysian and stateless community living in the vicinity of the same area, especially in Omadal Island. Iskul wants to be a space where we bridge the marginalised community to the world.